When you learned about The Periodic Table of Elements in high school, it probably didn't look like this. Above, we have a different way of visualizing the elements. 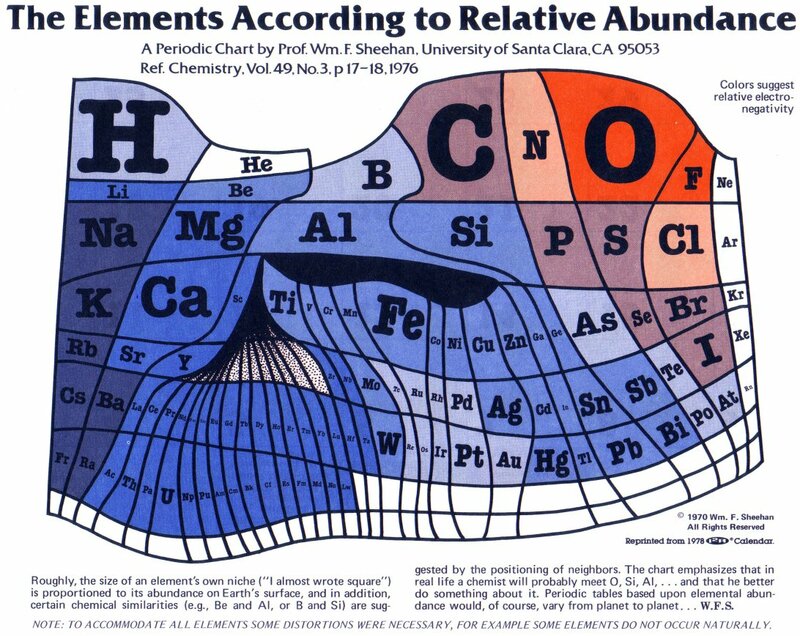 Created by Professor William F. Sheehan at Santa Clara University in 1970, this chart takes the elements (usually shown like this) and scales them relative to their abundance on the Earth's surface. In the small print beneath the chart, Sheehan notes "The chart emphasizes that in real life a chemist will probably meet O, Si, Al [Oxygen, Silicon and Aluminum] and that he better do something about it." Click here to see the chart -- and the less abundant elements -- in a larger format. Below we have a few more creative takes on the Periodic Table. Are the sizes proportional to abundance directly, or the logarithms of the abundances? Yeah. I’d think there should be more hydrogen and iron. Hydrogen is the most plentiful substance in the universe, and the earth is a whole lotta iron with some other stuff. haha Si is silicium, not silicon ! Google “si periodic table” and see what you get. I thinks this is incorrect because it does not have the atomic mass nor number. About the table of elements. This isn’t very accurate, as the least abundant element is Astatine at the bottom of group 17 and it doesn’t have even close to the smallest box. There is not more Platinum (Pt) and Palladium (Pd) than Nickel and there isn’t more Gold (Au) and Silver (Ag) than copper. cool concept but plain wrong. Does anyone know who gave our post a mention on Facebook today? How many times are you going to repost this without reading some of the legitimate criticism of this misleading graphic?